Earlier in the Spring Neil put up a bird’s nesting box high on the wall, out of reach of cats and other creatures. 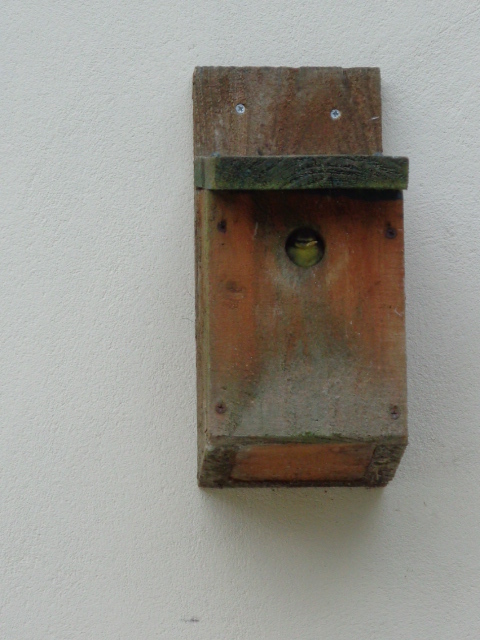 Two Bluetits have taken up residence and we saw them continually coming and going as they were nest building. Then we started to hear the cheep cheep cheep coming from the box and knew that the baby birds had hatched. One is getting quite bold now and keeps appearing at the door way. After standing there for quite some time I managed to catch a picture of him at the door . You can just make him out. I wonder how long it will be before they fly the nest.